The UK’s Port of Blyth has released performance figures that confirm another year of success and growth, including encouraging financial results that are among the best in the Northumberland port’s 135-year history. The port has recorded a turnover of £20.6m alongside an adjusted operating profit of £1.32m, while in anticipation of growth over the next five years, total investment in 2017 climbed to more than £4m. Already known as one of the UK’s leading offshore energy bases, Port of Blyth welcomed a number of high profile new tenants in 2017, such as market leaders DeepOcean and Global Marine Group, which contributed to both rental and operational income. In addition, the installation of EDF Energy Renewables’ Blyth Demonstrator Offshore Wind Farm, which is being utilized to test new wind energy technology, led to the French energy giant’s renewables business creating an operational base at the port’s South Harbour terminal. The port enjoyed a record year for commercial vessel movements which grew by 3% on 2016’s previous record high while total cargo tonnage increased by 6% over the same period. Meanwhile investment reached £4.2m for the year as the port undertook its most significant level of development in more than a decade. In preparing its infras- tructure for an expected period of growth in the short to medium term, the port continues to respond to considerable interest from the market for its services. 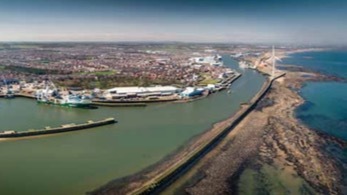 The Port of Blyth’s financial results have been published in its annual review of 2017 and confirmed at the port’s recent annual public meeting, both of which form part of its commitment to its stakeholders as a leading UK Trust Port. Port of Blyth is the port operating division of Blyth Harbour Commission, an independent statutory trust established in 1882 and is one of the largest Trust Port’s in the UK handling up to two million tonnes of cargo per annum across five terminal based around the River Blyth. Together with major logistics and training divisions, the port group turned over £20.6 million in 2017 and despite challenging global trading conditions has again set numerous records for perfor-mance for the year. Such success has been driven by growth across a variety of sectors but particularly offshore energy (oil & gas and wind) with the port is now recognized as a major strategic east coast base supporting the sector. Other trade handled includes containers, dry bulks (coal, aggregates, cement etc) and marine fuels. As a trust, all profits are re-invested back into the port to improve facilities and to provide benefits for its wider stakeholders.